The vet said to keep her on grass and no feed until she looses weight. That was her first ride with almost no protest and I have been riding her every day since then. she has gotten much less hesitant and a lot more willing to move, she just will not trot. I believe part of her issue is that she has never been barebacked, I just don't have a saddle for her yet. I don't think she is in any pain, because she moves really quickly almost every day, just not when I'm riding. I just dont know if I'm using the wrong cues or if she is simply protesting. I believe many of my issues will be resolved once I get a saddle. That video is not a very good representation of how she is currently moving, I just dont currently have another video. I don't think she is in any pain, because she moves really quickly almost every day, just not when I'm riding. What the horse does on their own in turn out is NOT a good indicator of whether they are in pain or not. Here's a picture of my extremely arthritic horse bucking and playing with the 2-year-old colts (can barely see the tail of one behind him). 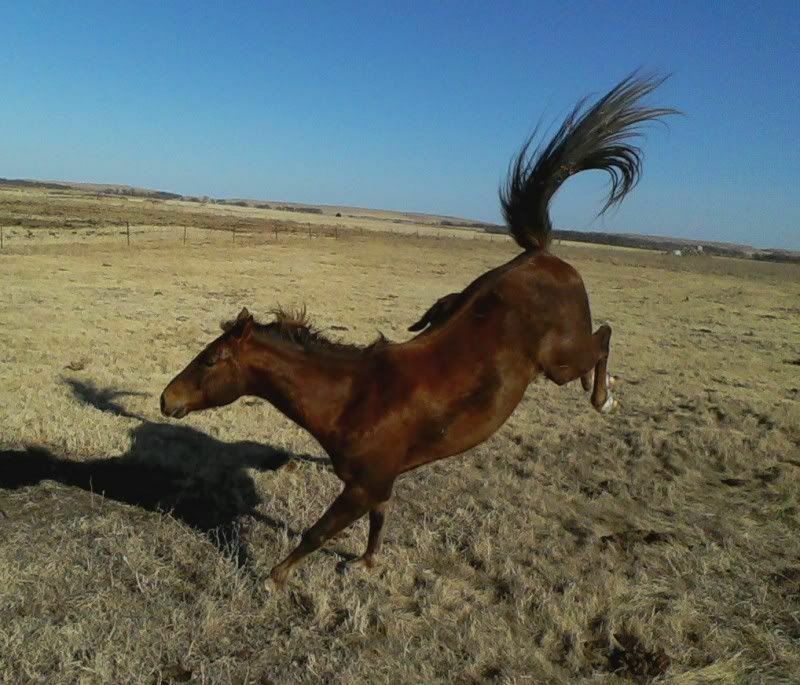 Most days, he could not trot on his own in the pasture. But he would have a "good day" once in a while and he'd be out romping with the rest of them. And doing so while in pain. So again, just because you see your horse "moving quickly" does not mean she is not still in pain. And then when you add the weight of a rider, it puts more weight on those front feet, and makes sense to me on her reluctance to move. Her episode wasn't even a month ago. Honestly, I think you are expecting too much too soon. She needs time to recover. I would not be pushing her to exercise yet. The vet said to keep her on grass and no feed until she looses weight. I would encourage you to start doing some research on your own. Obviously, your horse does need to lose weight but if she has foundered once on grass, she can easily founder again. If this were my horse, I would NOT have her on grass at all while she recovers and would very, very carefully reintroduce it in small turnout times. Yes, she is overweight and that contributes, but the sugars in the grass *may* make it take longer for the soft tissue to recover and reduce the inflammation. Here is one such website to get you started on your own education about laminitis. And here's another. Yes, trust and listen to your vet, but it's good to do yoru own research too. I would disagree with your vet on allowing her to continue to be on grass at this point. I would be feeding only hay. She is very clearly protesting. Please listen to what she is trying to communicate to you. She may be running away from you because to her, riding means she hurts worse. A horse moving well loose during turnout doesn't necessarily translate into no pain. Far from it. You're asking for too much, too soon. It can take a long time, if ever, for a foundered horse to be ridable. I wouldn't get a saddle now, either. She's too fat, and one that fits now won't fit once she's a healthy weight. There is a lot you can do with her other than riding. Take her for slow walks on lead on soft footing. Work on lateral flexion, or just sit with her and get to know her. She has foundered before, and was being extremely overfed by her previous owner. That is why I believe she will be ok on just grass. She was receiving well over 6 pounds of feed every day on top of 6-7 large carrots and grazing. I do not have any place to keep her other than her pasture anyway. Her stall is connected to her pasture and does not have a door on it yet. I believe my vet has given pretty good advice and will continue to trust him. I have done lots of research, even before getting a vet out, and I have spoken to multiple different vets about this situation. My current vet did take x-rays but I currently do not have pictures of them. He pointed out very little rotation and he said he laminitis was very mild. We are taking care of her, and she does just fine riding at a walk. I believe I simply do not have the correct cues to communicate what I want her to do. I would not be riding her if i thought even for a second she was in pain. She showed about 10 seconds during one ride where my father thought one of her hind legs wasn't moving properly and I immediately got off and cleaned her up. The farrier that came last week said riding was ok because of how mild her laminitis was and that she wasn't showing any signs of pain. I am not asking for advice on wether or not I should ride because based on my research, what the vet and farrier said, and how she is responding, she is perfectly fine being ridden. I am simply asking for someone to help teach me the cues to use to communicate to her. also, I should have clarified that she would run from me before I was even riding or working her at all. She simply does not like being caught. I have no experience with ropers, but guess they don't trot that much, may not be a natural thing for her. A roping horse trots the way every other horse in the world trots, there is no magical cue. Your horse is sore, big overweight body on little tiny legs. You can keep riding her at a walk on that soft pasture. It's probably good for her. I have a feeling if you push her into a faster gait, she might limp or she might buck. If you must leave her on grass because you don't have the resources to drylot her and give her hay,, I would limit the times she grazes. Does she have a paddock or just an open field? Do you have the resources for a paddock? Cedar & Salty likes this. I was told to never look at the horses face when approaching or he would run. It was the only way I could catch his rope horse and I didn't ride him just needed to catch to feed and he would be gone...so figure that one. The horse was noticeably flaring their nose. So, forget doing anything more than walking for now. Build up endurance and stamina, increase the horses cardio ability for itself and for carrying you astride for the jaunt around the grass field. It will take time, weeks to a month or more to build up stamina and endurance, cardio function to cart all that weight around for any length of time forget at increased speed...best thing for this horse right now if you get off and both go for walks together. Condition together some going for walks before getting back astride...truth. Everything in moderation and with a build-up of duration, intensity used with all exercise made to do. In a month of doing this every night, you both will be ready to jog/trot short distances, then the build-up begins again same as you did walking.